On a cotton farm near Emhouse, Navarro County, Texas, the third president of Texas Baptist Institute, Ray O'Dell Brooks was born on March 7, 1923. He was the second child and only son of the family of four born to Jack and Lalia (Ray) Brooks. In 1925 the family moved to Barry, where his father continued and concluded his life as a very successful cotton and livestock farmer. His parents were dedicated Christians and very active in the Barry Methodist Church of which he became a member very early in life. His schooling was begun at the age of five when he and six year old sister, Tommye, were enrolled in the first grade of Barry Public School. During high school years his greatest interest was Vocational Agriculture. Inspired by his farmer father and Ag teacher, Richard Burleson, he began preparations to follow a dual life of farmer and Ag teacher. His Vocational Agriculture class projects provided a bank account of over $500 which was to provide for much of his college education. After graduating from Barry High School in May 1939, he enrolled in Texas A&M College in June. SERVICE TO HIS COUNTRY In September just prior to enrollment time for his senior year at A&M, he joined the Naval Air Corps to help his country win the war into which she had been forced by unscrupulous enemies. Thirty-nine months would pass before his studies would be continued. After completing a number of pre-flight and flight courses, he was commissioned Ensign Brooks and presented the golden wings of a US Navy blimp pilot at a Pearl Harbor Day service at Lakehurst, New Jersey, December 7, 1943. The next twenty-one months were to be spent in two ten-month tours of duty in Brazil divided by one month duty at Elizabeth City. N.C. While home on leave between tours of duty, he met Mickey Evans. Following a ten-month courtship by letter they were married in September 1945, one month after his transfer to the Dallas Naval Air Station. Following his December 1945 discharge, studies at Texas A&M were continued during which time daughter Patty was born. Graduation was accomplished in August 1946. He moved his young family to Blue Ridge, Collin County, Texas where he taught Vocational Agriculture for two years before returning to his native Navarro County where he resided in Corsicana and taught Veteran's Agriculture for five years. It was in Corsicana that son Jack was born. 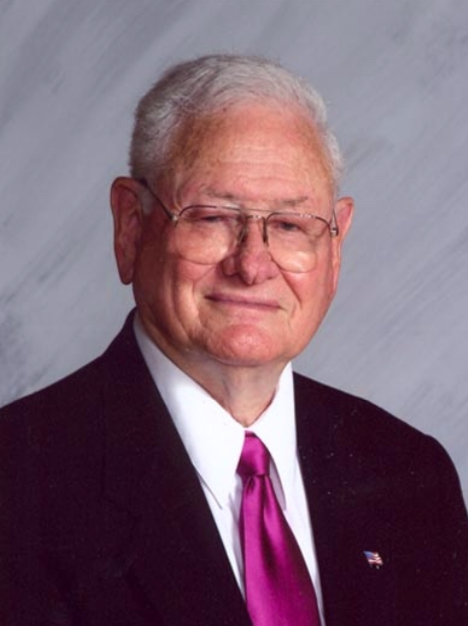 During these five years he also became heavily involved in a farming operation with his father and a brother-in-law which was concluded only when he moved to Henderson in 1953 to attend Texas Baptist Institute. SPIRITUAL LIFE Although Ray and Mickey were both reared in Christian homes, neither was saved until moving back to Corsicana. Church attendance and concern for spiritual things began to be important to them as the grave responsibility of being parents settled upon their minds. They began to attend church services at Corsicana Missionary Baptist Church which was pastored by Dr. A. J. Kirkland. Soon thereafter, they were saved and became active in the work of that church. Ray answered God's call to preach the gospel in November 1951. At that time he had just suffered a severe crop failure in the 1951 drought. With the desire burning deep in his heart to attend Texas Baptist Institute, he remained in Corsicana two long years continuing to teach school and farm, and with the Lord's blessings paid all debts incurred in the crop failure of 1951. Soon after being called to preach, the Hopewell Missionary Baptist Church of Navarro, Navarro County, Texas called him to be her pastor. He was ordained to the full work of the ministry by the Corsicana church in February 1952. Ray moved his family to Henderson on September 11, 1953 to begin a continuing relationship with Texas Baptist Institute that has varied from student to president. The December 1953 call of the Long Branch Missionary Baptist Church to be her pastor was accepted and continues to this time.